Enjoy a Vespa foodie tour of Saigon by night or enjoy a meal in the surroundings of an old French colonial house. Alternatively dine at Restaurant Nineteen or Square One. Discover Vietnam’s modern history through a visit to the Reunification Palace and War Museum. Travel by coach to My Tho to board the luxurious Scenic Spirit. Arrive in style by tuk tuk and immerse yourself in the historically celebrated luxury of Raffles, Hotel Le Royal. Enjoy a guided history tour followed by an indulgent high tea prepared in front of you by the hotel’s chefs, all whilst sipping on your signature cocktail named in honour of Jacqueline Kennedy. Retire to the Elephant Bar before returning to the ship. Later this afternoon visit the National Museum and the Royal Palace with the famous Silver Pagoda within. Drive a short distance to Prek K’dam to re-board Scenic Spirit. Later sail downstream to wander through the silversmith village of Kho Chen before continuing your cruise to Kampong Cham. Take your premium seat at the colourful Cambodian Circus, Phare. Begin the day with a visit to the colossal Angkor Wat, before stopping at Angkor Thom and the multi-faced Bayon Temple. See the Elephant Terrace before enjoying a refreshing Khmer lunch. Later visit the atmospheric Ta Prohm Temple as seen in the film Tomb Raider. Tonight be wowed by a magical themed gala dinner at an Angkor temple, with included drinks and a show featuring Apsara dancers in front of candle lit temple ruins. Fly to Pakse and discover this quaint city before travelling to the small town of Champasak and your boutique hotel for the next two nights. 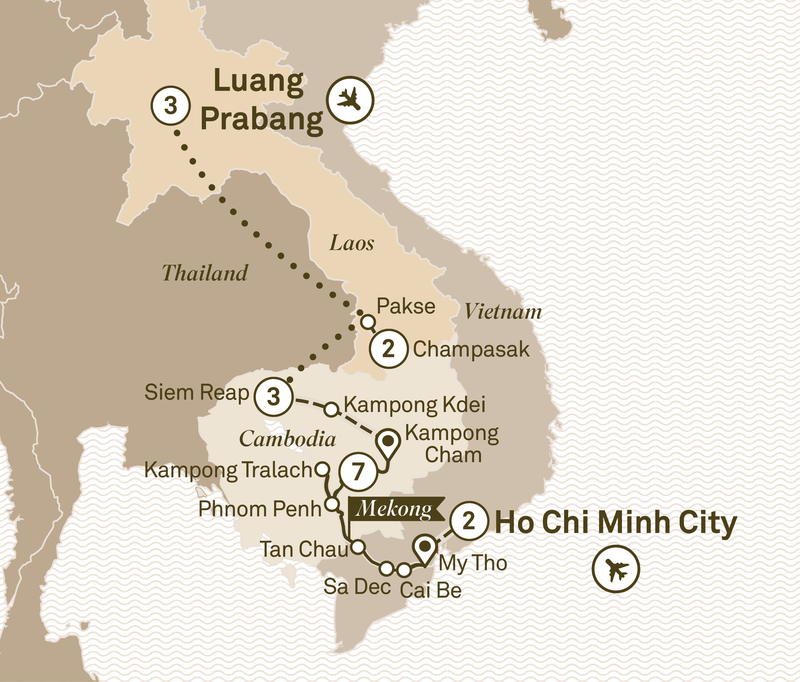 Fly to Luang Prabang, the spiritual capital of Laos, for a three night stay at your colonial-style hotel. Partake in morning alms by donating food to the local monks. Later, visit the former Royal Palace, Wat Xieng Thong and Wat Mai before cruising to the mysterious Pak Ou caves to see hundreds of centuries-old sacred Buddha images. Immerse yourself in local spirituality during a traditional Baci ceremony and pay respects to ancient animist traditions. Watch the sun set from the top of Mount Phousi or shop in the night market below before heading to your delicious farewell dinner. Say farewell to Laos with many wonderful memories of the people and places you have visited during your Indochina adventure.